courtney marie is a writer and artist based in Denton, Texas. she enjoys working with text as an art medium and performance object and sometimes she plays music with her friends. her first poetry chapbook, don’t get your hopes up, was released in 2018 in a double publication through Thoughtcrime Press, alongside her dear friend Fatima-Ayan Malika Hirsi’s Moon Woman: Mythologies and Truths. courtney marie lives with two cats, loves to travel, and writes a lot of letters. Nina eats cookies. And fragments sentences. When she's not teaching high schools students how to animate and take good photos, she's either drawing stuff, fixing things, or hanging out with her corgi, Noodles. She’s here to help. She tries to remember to post as @ninacdot on Instagram and Twitter. Conor Wallace, a big old nerd, born and raised in the chorus of Denton tx, has been consciously cheerleading and reminding artists to continue their bliss and work for a Decade... unconsciously; probably always. He is also a journeyman singer-songwriter and you can find his work at Bandcamp under the monikers/collaborations: Conor Wallace, Ella Minnow, and Forever & Everest. Machele Johnson is a Dallas based poet and musician who has been sharing her words and sounds for a little over a year and a half. A melomaniac since birth, Machele's inspirations for writing are sound and music with its complexities and structure. She has a need to study, experiment, and report back on the numerous, wordless joys and sorrows one can experience while lost in sound as well as rejoice in the similarities of the human experience and harmony. Sarah is a performance artist and designer whose work centers around intersectional feminist issues utilizing the body as the primary means of expression and critique. Sarah received her M.A. from the University of North Texas in 2016 with an emphasis in Performance Studies. Her work often explores the body as both a site and sight of activity, expression, pain, and pleasure. To check out her design work visit her Instagram page @_friday.designs_. Sean Enfield is a writer and educator based out of the Denton. He graduated from the University of North Texas with a B.A. in English-Literature. He has had work featured on NPR's All Things Considered as a part of their Three Minute Fiction Contest and published in Vine Leaves, F(r)iction Online, and Poetry Quarterly. His piece, "Paper Shackles," is forthcoming through Lunch Ticket. Visit his website at seanenfield.com. Fatima-Ayan Malika Hirsi is the founder of Dark Moon Poetry & Arts, a monthly series spotlighting the creative feminine and non-binary energies of North Texas. She can often be found on sidewalks using her typewriter to birth poems for strangers. She has been published in Entropy, The Boiler, Anthropology Now!, Bearing the Mask, and elsewhere. Her work has been featured by WFAA, KERA, the Dallas Morning News, and others. Her chapbook, Moon Woman, was published by Thoughtcrime Press in June 2018. Sebastian Hasani Paramo is the son of Mexican immigrants. His work has appeared in Pleiades, Front Porch Journal, Prelude, Huizache, upstreet, North American Review, & other places. He is the Editor-in-Chief of The Boiler. He is a teaching fellow in the doctoral program at the University of North Texas where he is the Production Editor for American Literary Review. Visit his website at sebastianparamo.com. A lover of learning, Caitlin has attended culinary school, an ice cream class in Pennsylvania, and courses in everything from cheese-making to chocolate-baking. Her culinary expertise has found her in many a kitchen, as short order egg cook, a fine dining chef, kitchen manager, and even running a baked goods shop at the Denton Community Market. Born and raised in Denton, Caitlin is a longtime travel and food fanatic and spends most of her time browsing cheap flights and day dreaming of devouring pastries in Europe. Bess is a writer, cellist, and long-time Spiderwebber living in Denton. She holds an MA in creative writing from the University of North Texas and currently works as the marketing manager for UNT Press. Bess has helped organize Spiderweb shows for almost five years. Her work has appeared in dozens of the Salon's zines. Chris has been a part of the DFW theatre and arts communities for the last decade as an arts journalist (Stage Directions Blog), a freelance director (Denton Performance Lab), educator and cheerleader for artists stuck on an idea. He lives in Denton with his family and you can often see him running in large groups as a founding member of the Denton Area Running Club. Bonnie Jo Stufflebeam curates the annual Art & Words Show in Fort Worth. She also writes fiction and poetry both speculative and literary that has appeared in over 40 magazines such as Masters Review, Clarkesworld, Lightspeed, and Everyman's Library's Monster Verse. She has been a finalist for the Nebula Award and Selected Shorts' Stella Kupferberg Memorial Prize. She released an audio fiction-jazz collaborative album Strange Monsters with her partner Peter Brewer's Easy Brew Studio in April 2016. You can find her online at www.bonniejostufflebeam.com or on Twitter @BonnieJoStuffle. Elia Tamplin likes silence, food, dismantling systems of oppression (and lists). When not engaging in the arduous (yet rewarding) task of dissertating or consuming massive amounts of black coffee, they can be found out on a walk chatting with their mother. 30% of their half-written songs see the light of day, while 97% of their full-length songs are influenced by Romantic Comedies, the Bible, and a perpetual melancholy. Alex Stock has been a part of Spiderweb Salon since 2012. They are a self-taught, multi-media artist with a biology Master’s from the University of North Texas. Their work focuses on the often stifling dynamics inherent in social conflicts from the macabre lens of the natural world and its parallels in animalistic predator and prey relations. Alex works in many different mediums from illustration to interactive artwork and large scale sculpture. Matthew Long is a painter, sign maker and designer living in Denton, Tx. He has worked with businesses including East Side Social Club, the Greater Denton Arts Council, Paschall Bar, Aura Coffee, Perfecto School of Music and LSA Burger. Leah Jones is an editorial photographer and menswear stylist based in Dallas. Her work has been featured in publications such as Men’s Health, GQ, Vogue Online, Los Angeles Times, Martha Stewart Wedding, Marvel Digital Content, and she has shot print work for Disney brands and Neiman Marcus. Leah moonlights as an event photographer focusing on local musicians and artistic collectives. She has been lovingly photographing Spiderweb Salon showcases for many years and deeply appreciates the opportunity to celebrate all people and document their artistic expressions. To preserve sanity, she dances frequently, and enjoys writing short scripts and essays dealing in terribly twisted horror or bounding comedic gaiety. She resides in Downtown Dallas with her partner, Jacob, and their beloved cat, Waffles. Jacob Greenan is a multi-instrumental musician and studio & production assistant at Shiny Sound Recording Studio. Jacob has been known to play everything from piano to an upright bass over the years across the great state of Texas in such projects as The Hazardous Dukes, Forever & Everest, and Here In Arms. Frank is a freelance artist, videographer, and the co-founder of Dallas art space PARIAH, an eclectic hub for performance art, experimental noise, media installation, painting, and other 2d media. Together with Joshua van Ammon, Frank created CONVERSATIONS IN THE VOID, an video-based artist interview series, and is the executive producer for Spiderweb Salon’s podcast series focusing on the stories behind the work of living poets and writers, THE LITERARY PODCAST. Storie is a professional cookie eater, wine drinker, and critter wrangler who discovered her creative medium by making a complete and utter mess in the kitchen. She's got a passion for force feeding people, making terrible puns, and obsessively baking meringues. Born in Tupelo, Mississippi. Raised in Denton, Texas. Graduated with BFA in Graphic Design from Texas State University — San Marcos. Lived in Austin, Texas for a while. Graduated with MFA in Illustration from the Academy of Art University in San Francisco. Currently lives in Denton, Texas. 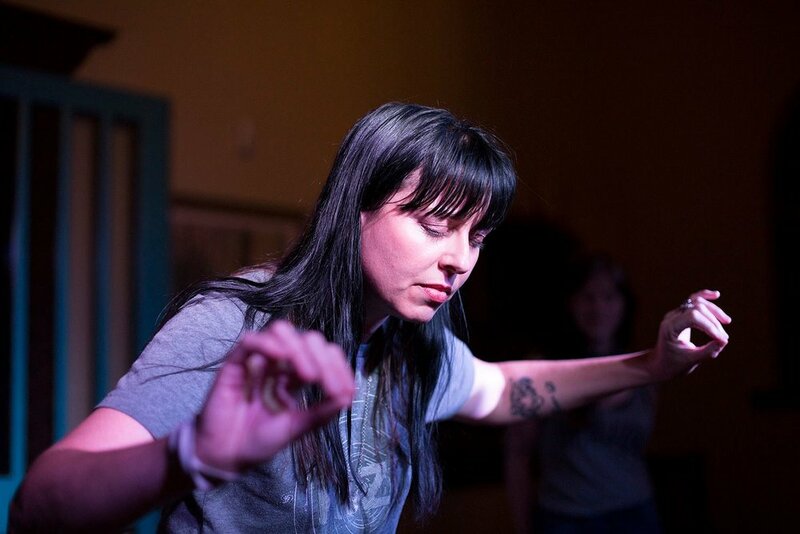 Sarah Ruth is a diverse musician and artist – a multi-instrumentalist, she employs hammered dulcimer, harmonium, electroacoustic sound art, and extended vocal techniques. She performs frequently both solo and with multiple bands and improvisational ensembles in the North Texas area and tours nationally. Joanna Lugo is a Puerto Rican-American director, writer, performance artist, and activist, currently serving as Associate Producer for Ensemble, an experience design firm based in Dallas. Prior to joining Ensemble, Joanna assisted in curating a season of plays and musicals at the 2017 Tony Award-Winning Dallas Theater Center as Interim Artistic Producer, performed in Kate Gilmore's exhibition, Only in Your Way, and taught as an Adjunct Professor at UNT, where she designed Performance Studies courses. Her work spans across educational and artistic institutions, where Joanna has worked as Visiting Director, Teaching Artist, Grant Writer, Literary Assistant, and more.